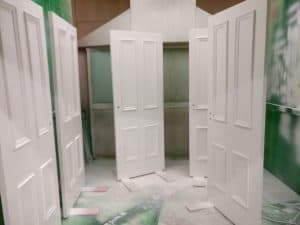 With our in-house spray finishing service we can supply our joinery products fully factory finished. In either a solid (opaque) colour or in one of our translucent stains which show off the natural beauty of the timber. If requested, our finishing service ensures all of our joinery products receive three coats of microporous water-based paint as standard. This means that a full refinish is not required on site. Resulting in a high quality finish and a quick and easy installation. We use an environmentally friendly water based, spray applied, finishing system. Specially developed for harsh climates, the Teknos 3 part paint or varnish system consists of one base coat and two top coats. Being both micro-porous and flexible, the Teknos system is ideal for exterior joinery. We can colour match to pretty much any paint colour as long as we are given the manufacturer paint range and colour code to work from. All the Teknos paints we use are water based and provide a high quality micro porous protective film over the timber. This gives a finish which is both flexible and durable. The paints we use are also all designed to be resistant to bacteria and mould whilst also having a UV inhibiting compenent. This will help prevent discolouration and breakdown through sunlight. The range of colours available in the system is simply staggering. We can pretty much colour match to almost any given paint or RAL code. The Teknos paint is spray applied ensuring a quick application of the paint. Properly applied to the recommended thickness and with no thinning required. Teknos products require an application thickness which is about 3-4 times thicker than a professional decorator would achieve with a brush. Providing the paint is maintained to a good level, the joinery will last for many decades ! Teknos paint flexibility and thickness helps ensure this longevity. At Belfast Bespoke we always follow the same procedure when spray painting our joinery. Our meticulous process ensures a perfect finish. With the application of Teknoseal 4000 end grain sealer, all the most vulnerable areas of the joinery are treated prior to the top coats being applied. 1) Depending on timber species and finish required, the appropriate base coat or anti stain primer is spray applied. 2) End grain sealer is then applied which helps prevent water penetrating the end grain of the timber. 3) The paint finish is then de-nibbed (Sanded smooth) to ensure a perfect finish. 4) The first of the topcoats is then applied and again de-nibbed before the final coat. This procedure ensures we can achieve a perfect and long lasting finish. The Teknos Varnish system offers exceptional clarity and durability, which enhances and protects the natural definition and beauty of the timber. Water based and combining the different shades of base stain with two flexible, breathable topcoats, different finish shades are possible. The Teknos system is durable, environmentally sympathetic, and minimises the cracking and peeling associated with traditional solvent based stains.